In 2006, the term “reproductive health” made it into a binding international law treaty for the first time, the Convention on the Rights of Persons with Disabilities. 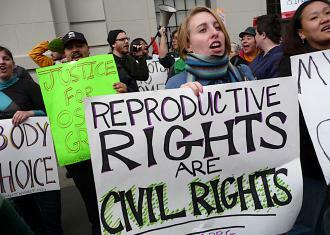 While this was a victory for the reproductive rights movement, it produced mixed results. Twenty-three nations opposed the term. After it was reluctantly included, fifteen made statements reminding the term’s proponents what they had assured them throughout the negotiations: that the term “reproductive health” did not include abortion or create any new rights. Thus the words were “cascading” into national and international documents, but not the norm. The movement thus fell far short in the third stage of establishing universal agreement, “norm internalization,” which is marked by a tipping point when debate about the norm ends. To the contrary, debates continued, most notably in the U.S., which had adopted one of the world’s most liberal abortion laws in 1973. In particular, debates pursuant to President Obama’s health care initiative, “Obamacare,” increased contestation about whether abortion is health care per se, a bedrock tenet of reproductive health. The movement sought a bridge too far. Strategic overreach and tactical missteps included the decision to keep ties to the powerful but discredited population control establishment from which the movement sprang, a lack of evidence that abortion is health care, specifically maternal health care, and a deliberate ambiguity about whether abortion is included in reproductive health. While ambiguity was meant to garner wide acceptance of the term, it allowed nations to redefine it to suit local conditions. Norm entrepreneurs insisted the term did not include “any new rights” to an outside audience. At the same time they tried to indoctrinate an ever-widening constituency on the centrality of abortion rights, a base that included women from the developing world who were no on board with the mostly Western feminist agenda. Like a toy that emerges from different factories but with wide deviations from the original plan, reproductive health did not emerge as the same product everywhere and could not be said to enjoy universal appeal. This undercut claims that reproductive rights were human rights, which are by definition universal as they are inherent to all human beings. Along with human rights, the movement worked on a second front, international development. By some measures they were more successful adjusting facts on the ground without debate, by the force of institutional momentum. Attaching reproductive health programs to badly-needed water sanitation and children’s health projects allowed them a nose under the tent if not more. They acknowledged their approach as a sort of confidence game. They need to propagate the perception that abortion is a right in order to convince governments to liberalize their laws, believing that the right may eventually be recognized as a result of state practice, by custom. Advocates on both sides of the debate have expressed a desire to move beyond rehashing the definition of reproductive health. With few exceptions, the international pro-life movement agrees that the term “reproductive health” could only be acceptable if it is defined in a consensus document as excluding abortion. Otherwise it remains fraught with danger and should be rejected. As long as contestation continues, the norm cannot be said to be internalized. Thus resignation about the inevitability of reproductive rights is misplaced, but so is complacency about its failure. The movement has made significant inroads and may likely gain more ground. A norm, as a standard of right conduct, exists in the realm of values. People, not states, entertain ideas and internalize values. Reproductive rights will only become an international norm if men and women decide that its aims are true, good, and just. To do that they must know what those aims are.